CCW – concealed carry weapon. Revolver – Handgun that usually carries 6 rounds in a cylindrical chamber. The wheel or chamber rotates a new round into firing position each time the trigger is pulled. Semi automatic – any firearm that extracts the spent round and loads a new round into the firing position each time the trigger is pulled. Automatic weapon – Any firearm that automatically fires numerous rounds while the trigger is held back in the firing position. Magazine – The bullet holding device for a firearm. Usually loaded into the grip of the firearm containing a spring follower to feed the ammunition into the firearm. NOT to be confused with a CLIP. Clip – A clip is a device that is used t store multiple rounds of ammunition together as a unit, ready for insertion into a magazine or firearm. The defining difference between a clip and a magazine is the presence of a feed mechanism in a magazine, typically a spring loaded follower, which a clip lacks. Rig – Holsters, belts, gun or supports of any part of the system that is involved in the carrying of a concealed weapon. Anti gun proponent – Any person or group of people who believe without question, or have the ability to digest and critically review technical data, who believe that more gun laws will make our streets safer, end criminals using guns, stop all murders, create a utopia society and generally complete the “Rainbow skies and Unicorn pastures” vision that they envision. Gun Advocate – Any person who believes our Constitution gives them the right to defend themselves and their families from those that would do us harm, including the Government. A person who understands the “Rainbow skies and unicorn pastures” vision, but understands we live in a society that is not quite there yet….. Grip – The part you wrap your hand around on a firearm. Barrel – The part the bullet exits from. NOTE: NEVER look down this end. Trigger – The part that your finger presses on ONLY when you want the firearm to go BANG. Trigger guard – The “Hoop” type bar that protects the trigger from inadvertently being depressed causing the firearm to negligently discharge. Sights – The sights consist of the rear piece divided into two pieces and the front that is a single pin or dot. Aligning the front sight in between and even on the top is critical to placing a round in the desired area of whatever it is you are shooting at. Ammunition – Consists of the bullet, the part that leaves the firearm and hits the target, the casing, the part that is ejected or removed from the firearm after shooting and the powder inside the casing, the part that sends the bullet down the barrel and makes the loud Bang noise. Assault Rifle – A firearm used mostly by the Military in our country, designed for semi auto fire, one pull of the trigger sends one round, burst, one pull of the trigger sends three rounds or automatic, one pull of the trigger sends rounds continuously until the trigger is let loose or the magazine is empty. Or more appropriate today…. Any firearm that the Government or Media chooses to target as the root of all evil. 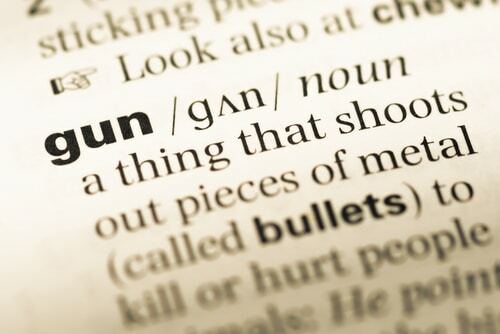 Ar-15 = assault rifle, AK-47 = assault rifle, Browning bolt action deer rifle = Assault Rifle, Remington semi auto turkey shotgun = Assault Rifle…..
Hey Buddy!, I found this information for you: "Gun Definitions". Here is the website link: https://thegunrights.com/gun-definitions/. Thank you.